The Agricultural Safety and Health Council of America (ASHCA) annual conference was held February 21-23 in Scottsdale, AZ. Carrie Klumb represented UMASH with a table full of center-created resources. 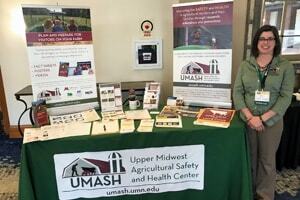 UMASH made connections with researchers, non-profits, and farmers from throughout the United States all motivated to improve ag worker health and safety. Several people were interested in incorporating our resources into their on-farm safety programs or into their classrooms. Carrie was also able to attend sessions that covered topics such as: strategies to build support for ag health and safety, building a safety culture, a 2020 vision for safeguarding youth working in agriculture, strategies for farm worker health, wellness, and wellbeing, and front line supervisors: your keys to safety program implementation. The ASHCA meeting was a great place to connect with other Ag centers, learn about new non-profits, and speak directly with those working on farms. This was a great opportunity to get our resources into the hands of those working on the front lines of ag workers health and safety.